Inland Building Systems offers many structural choices to match the type of framing that your project requires. We performs all welding and related operations according to the latest editions of the Structural Welding Codes for Steel, AWS D1.1 and Sheet Steel, AWS D1.3. 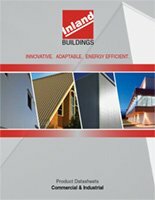 Inland Building Systems designs in accordance with AISI specifications. The Gabled Clear Span System is usually preferable for wide, open space requirements. The Gabled Multi Span System is one of the most economical choices for manufacturing or mixed use facilities including warehouse and distribution center applications. The Single Slope Clear Span System is an ideal choice for additions and smaller clear span requirements such as retail and office facilities. The Single Slope Multi Span System is the perfect choice for many commercial, office or manufacturing applications.